Rosie was about 10 months old when she started enjoying and interacting with the iPad. It was amazing how quickly she got the hang of using it! I’m always looking out for good app recommendations for Rosie to play and learn from. 4) Talking Paul. A panda that copies what you say and does some funny actions. Rosie was in hysterics playing with this from about 10 months. 5) Color Drops. – A simple and fun drawing, painting, colouring in game. 6) Faces iMake. – Make fun faces out of food, toys and other bits and bobs. 7) Toca Boca games. – These are firm favourites. Great games at reasonable prices. Rosie loves: Hairsalon me, Hair Salon 1 & 2, Pet Doctor, Toca monsters, Toca Mini, Toca Lab, Toca Cars, Toca Town, Robot Lab, Toca Band, Toca Tailor, Toca Train, Toca Store and Birthday Party. 8) Dr Panda games. – We’ve just discovered these. Dr Pandas Restaurant 2 is a favourite. We also bought Dr pandas Garden- also fab, and Dr Panda’s Hospital. Will definitely be buying more from this range. 9) My Little Cook : I Bake delicious cakes (kids mania) – Rosie’s favourite game at the moment. It’s kept her entertained for ages! 10) BeBop Blox. – a moving puzzle / building blog game, quite noisy! but Rosie likes it. 11) Lego IceCream – make lego ice creams for lego people. A fun, relatively simple game. The Lego Food game is good too. 12) Kid’s Dinosaur Jigsaw Puzzles -educational … (Espace Pty Ltd) – Rosie has spent a lot of time on this game. Piecing together realistic dinosaur puzzles that are quite tricky to do really! 13) Tickle Finger 1 – This is an interactive cute story with a funny little monkey going through the jungle. You have to tickle all the animals as you go through the moving book. 14) Charley Bear – Short video clips and little puzzles. If your children like Charley bear they will love this little game. 15) Elmo games – All children seem to love Elmo! Here are the three games we have for Rosie: Elmo Calls (where you can call and FaceTime Elmo) Elmo’s Monster Maker (create your own monster) and Elmo Stories (Elmo reads stories out loud). 16) Mega Photo: 100+ Free, Real-Time Camera Effects. – A great app for capuring fun selfies. Rosie can often be found photographing herself on this app with all sorts of fun effects /backgrounds etc. 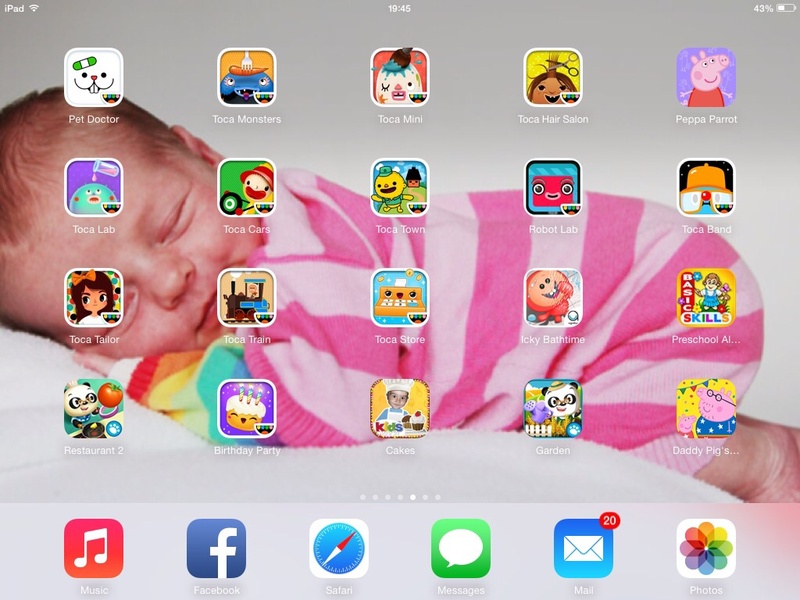 Please do share your favourite childrens apps here too. This entry was posted in Toys and Gadgets we love ... and tagged ipad apps. Bookmark the permalink.